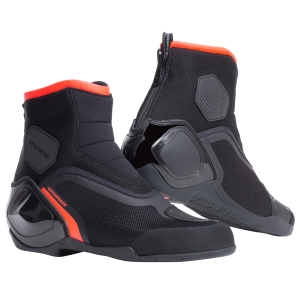 Italian protection specialist Dainese has added new waterproof shoes Raptors, Motorshoe D1, Dinamica, Metropolis and Shelton to its collection. 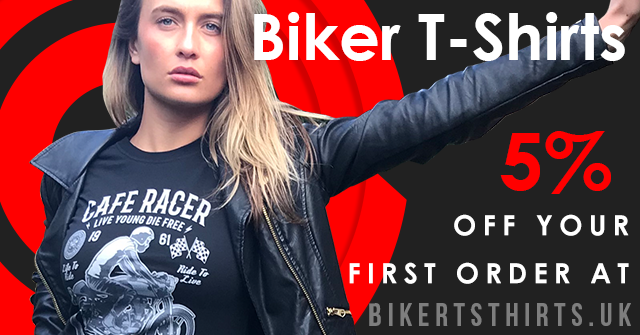 All are available to buy in UK D-Stores or through the dainese.com website. Providing everyday comfort with the versatility to be worn on and off the bike, Raptors D-WP are waterproof and lightweight with a multigrip sole. 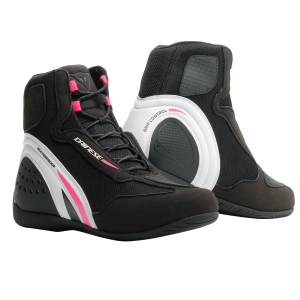 Protection and support comes from rigid inserts on the ankles, while the standout colourways and reflective inserts contribute to increased visibility.The Raptors D-WP is available in three colours (black/anthracite, black/fluo-yellow and black/fluo-red) in UK sizes 5-13 for men and 3-9 for women at an RRP of £149.95. 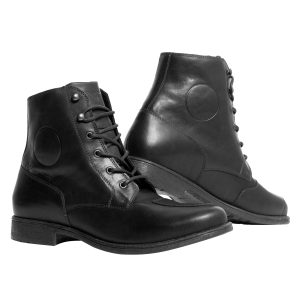 For those who want the comfort of a street shoe, but with the support of a boot, the Motorshoe D1 D-WP fulfils this role perfectly. Made from high tenacity polyamide fabric and suede microfibre, with a differentiated design on the sole that ensures optimum grip on footpegs and ground alike, Motorshoe D1 D-WP maintains Dainese’s high standard of safety with a reinforced polyurethane heel structure and rigid inserts on the ankles. 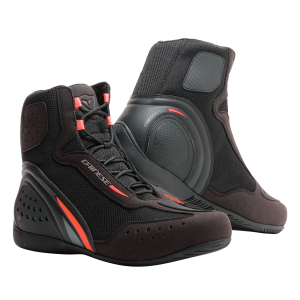 The brand new Dinamica D-WP combines an unmistakeable sporty and aggressive look, amazing protection and essential waterproofness, to provide those who prefer sport-styled kit with a more versatile option than a full boot. 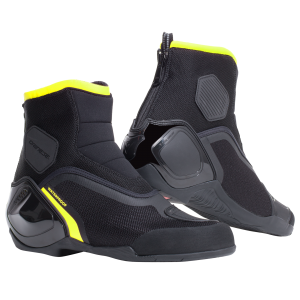 The D-WP membrane keeps feet dry in rainy conditions, while Dainese’s safety standards are maintained with rigid inserts on the ankles and heels and highly resistant polyamide fabric on the body. Easy to get on and off thanks to the rear zip, Dinamica also features flexible joints for extra walking comfort. With an RRP of £159.95, Dinamica comes in UK sizes 5-13 in three colour options (black/anthracite, black/fluo-red and black/fluo-yellow). The waterproof version of the new Metropolis shoes, these include the D-WP membrane to keep these high-top trainer style shoes dry in those English showers. The new differentiated sole design and smart zippers on the side make these shoes comfortable in all situations and quick to take on and off. 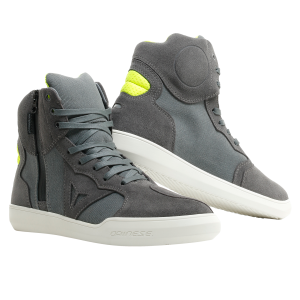 Made of cowhide suede with canvas fabric inserts, Metropolis D-WP also feature a leather gear shifter guard and reflective inserts. Metropolis is available in three colours (black/anthracite, anthracite/fluo-yellow and carbon/fluo-red) in UK sizes 5-13 at an RRP of £149.95. Characterised by their stylishness, the heavy duty Shelton D-WP are well suited to dealing with the everyday challenges of city riding. The Shelton D-WP shoes are made of superior full grain cowhide leather with a gear shifter guard and waterproof D-WP interior. 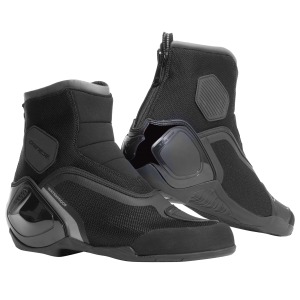 Protective inserts over the malleolus and modern safety technical solutions provide Dainese protection standards in a unique, casual style. Available in UK sizes 6-12, in two colours (black and dark-brown) and an RRP of £159.95. 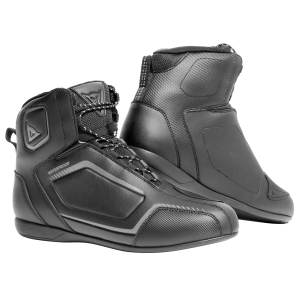 The post New waterproof additions to Dainese’s shoe collection appeared first on Superbike News.